About a decade ago, before Gordon Ramsay was a household name here in the U.S. and before every video under the sun was available on Youtube, he had a show in the UK called Gordon Ramsay Makes it Easy. In one episode, he made a simple broccoli soup that really impressed me and it’s a recipe that I’ve revisited on several occasions over the years. 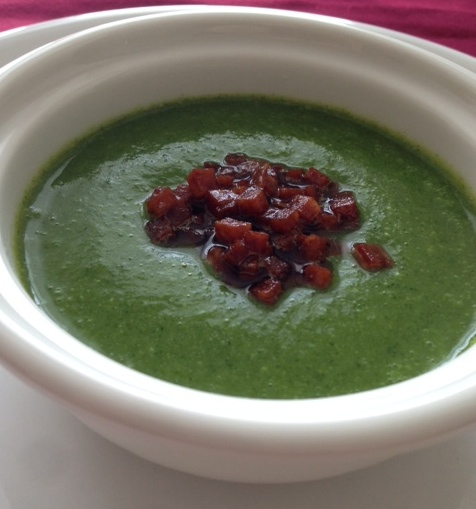 The reason it was so impressive is because the soup was basically just 3 ingredients- broccoli, water, and salt, yet the end result was a soup with an elegant flavor and texture you might even call luxurious. It’s simple, delicious and versatile. To make the soup, start by bringing some water to a boil with a little bit of salt. Drop in the broccoli florets and boil until they’re soft. Scoop them into your blender jar along with some of the cooking liquid. In terms of quantities, about 2 large stalks of broccoli will yield enough florets to fill my blender jar almost full, and for that amount, I would add enough water to go about halfway up the level of the broccoli. Cover the blender, but take the stopper out of the lid and cover with a towel. If you’ve never blended hot liquids before, do not take this step lightly because I don’t care how strong you are, you won’t be able to keep the lid on if the stopper is left in; if you don’t give it an opening to vent it will blow the top off the blender and cover your kitchen with broccoli. Even with the stopper out and a towel over the top, start with a few short pulses just to be safe before you allow it to really whirl. It should take less than 30 seconds to become soup-like. Just check the consistency and if it’s too thick for your taste, add some more of the cooking liquid and whizz it again. Add salt if it needs it, and then you’re done with the basic soup. While it’s fine as-is, you will almost certainly want to chef it up a bit. Considering it’s basically nothing but the essence of broccoli, I find that it needs a little bit of fat and texture to elevate the satisfaction level and there are many different ways to get there. In Gordon Ramsay’s tv show, he finishes it with a some walnuts and a couple medallions of ash-rolled goat cheese. I’ve made a nice variation topped with fried garlicky bread crumbs. Or if you are insistent on keeping it fat-free, I once made it with toasted sliced almonds and it was really good too. But this weekend, I came up with my new favorite rendition, the one you see pictured at the top of this post. In true chef fashion, I was inspired by the fact that Spam was in season, i.e. on sale at H-Mart, so I decided to go with it. I did a brunoise of Spam (the low-sodium kind) and browned it up in a little olive oil with pimentón (Spanish smoked paprika) for a little smoky accent. And since I was feeling extra ambitious, before I served it, I actually ran the broccoli soup through a fine mesh sieve for an even silkier texture. That’s something I remember reading that they do in the French Laundry kitchen- whenever a liquid gets transferred from one container to another, they strain it through a chinois. It makes a noticeable difference. I was really happy with the end result- a nice color contrast, luxurious mouthfeel from the broccoli, a beautiful scent from the paprika, and of course the savory addictiveness that can only come from a processed meat product! You had me at “processed meat product” – sounds great, I’ll give this a whirl. Cool, I think you’ll love it. It’s just amazing that broccoli can yield such a velvety texture without any cream or butter. Let me know how it turns out!